The tomb of Sheikh Haboos. 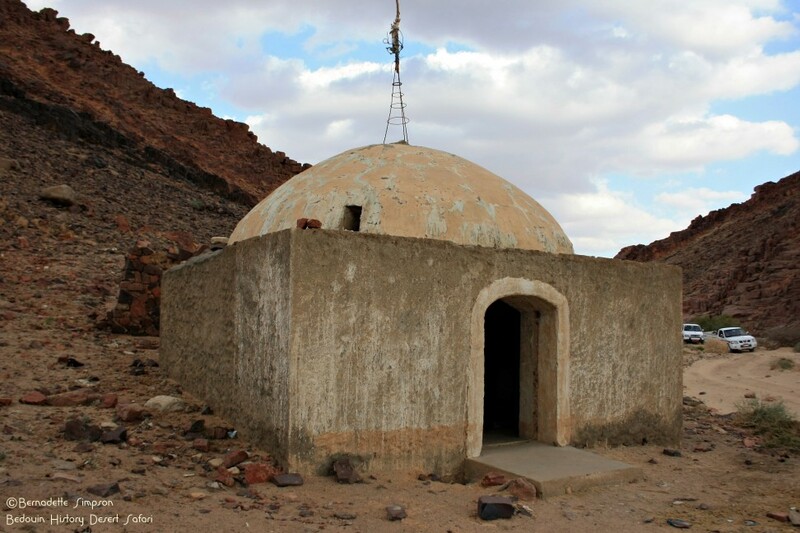 Small, domed tombs, like the one of Sheikh Haboss pictured above, can be found throughout the Sinai peninsula. When Bedouin need guidance, a blessing, or help with a problem – for example if a relative is ill, a wife is pregnant, or good crops desired – many will visit and pray at a holy sheikh’s (like a saint’s) tomb to ask for an intervention of their behalf from Allah. When this takes place on a sheikh’s birthday, it is called a “mulid”. Otherwise, this practice is known as a “zuara” and, depending on tribal traditions and the tomb visited, happens only on certain days. Mondays and Fridays are reportedly the busiest days for a zuara at the tomb of Sheikh Haboos, although it is not uncommon for one to happen on other days as well. Typically a zuara involves the sacrifice of a lamb, a shared meal, and – during a mulid celebration – much music and dancing. Nearby to most tombs you will find small stone buildings, “maq’ad”, used as shelters for praying, meeting, eating, and – of course – tea drinking! Men from the El-heywaat tribe slaughter a sheep at the tomb of Sheikh Haboos. 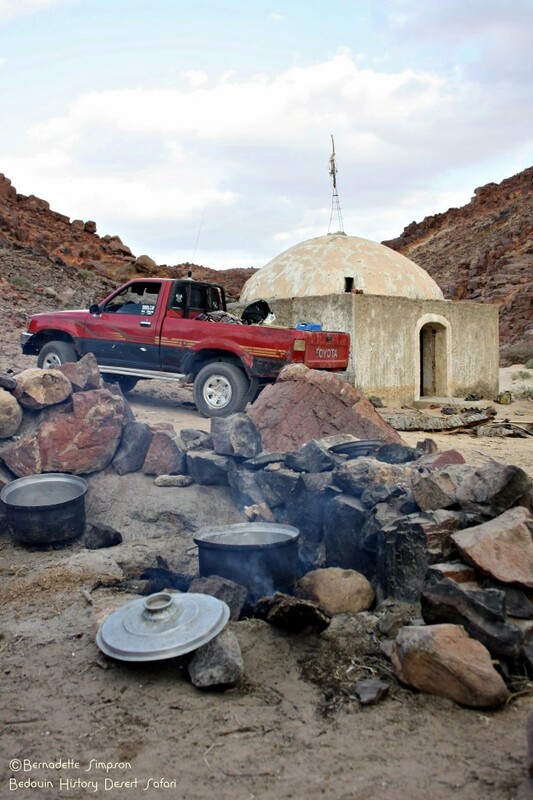 On a recent safari to the area near Sheikh Haboos’s tomb, we were invited to join a zuara by a group of Bedouin from the El-Heywaat tribe who were visiting from the Taba region. That’s an invitation that is hard to refuse! So we turned the truck around and backtracked to the tomb. Our guide, Freyj, happily helped set up carpets inside the maq’ad. As the man who would slaughter the sheep cleaned and readied for the sacrifice, the others prayed, started the fires, and began the preparations for the meal. Dried palm fronds that had been collected along the way and a large palm trunk found next to the maq’ad were used for the fire that would cook the meat. Smaller dried plants were lit for the fire built inside for tea. The cooking pot on the fire. Chunks of meat were thrown in the pot of boiling water with several handfuls of mountain salt. Livers and other innards were chopped and placed in a separate pan with oil and water. It would take several hours for the meal to cook so the men sat inside, sheltered from the chilly wind, as they drank tea, smoked, and chatted about a variety of topics. Eventually, the liver was served on a large round metal tray that we all sat around using pieces of thin fresh bread to scoop up bites of liver. After about another hour and a half, the meat was ready. Although we did not stay to share in this meal, the men would not let us leave empty-handed, being sure we had plenty of meat, both raw and cooked, to take back to camp with us. Mulids are celebrated throughout Egypt, by both Muslims and Christians, and the Bedouin of Sinai have their own unique traditions for these rituals, traditions that have changed over the years to these more simple, quiet affairs. You can read more about mulids in Egypt here. A New Place to Stay in Ras Sudr!